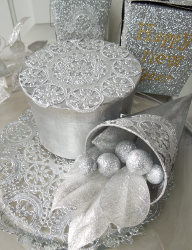 Celebrate the new year with a fancy and fun Silver Doily Centerpiece from Tiffany Windsor. Before your guests arrive, create this New Year's party decoration using paint, mache shapes and other embellishments. This piece is sure to make your party one for the ages. Spray mache shapes with silver paint. Let dry. Cut doilies to desired shapes/sizes. Apply Aleene’s Original Tacky Glue sparingly to back of doilies. Remember that less glue is better with paper! Press into place on mache shapes. Let dry. Arrange mache shapes with other party decor. For a comprehensive video tutorial of this project, check out Silver Doily Table Centerpiece.